“Recently I had purchased your one-gallon container of Urine Off for cats along with the battery operated sprayer. We began having a problem in our house with spraying and our usual cleaning routine simply wasn’t working. At the suggestion of my vet I tracked down and ordered your product, which I’ve been satisfied enough with that I more recently ordered three more gallons. While waiting for the new order of three one-gallon containers the battery operated spray gun died. I didn’t think it was related to the batteries (as there hadn’t been any decrease in power over time, indicating they were dying), but I replaced them to no avail. The sprayer was dead, period. I contacted your customer service folks in Hickory, NC and they very politely replaced my sprayer for free, which is what I hoped would occur, but was, nevertheless, surprised it worked out so well. Thank you for taking care of this problem very quickly, professionally and politely. I was rather dismayed that the old one died, especially since it doesn’t come cheap. But you folks made everything alright. “Finally after trying so many other products, I found that yours works and that I can use it around my pets. I have 36 kitties and 2 puppies and have been searching for a product that is pet friendly to help with the “accidents” that occur almost daily. “We rescued a male cat who we discovered had bad urine issues when around other cats. Over a two week period he just about ruined our house before we could find him a cat-free home. The worst offense was a stuffed chair I had just purchased. I had tried every household hint and product I could think of, with no success. I had visited your website, and then saw your product at the vet’s office so I purchased it immediately. Stall management is important when you own horses and they spend any amount of time stalled. Mucking out the stall at least once a day in necessary, sometimes more is needed, depending on how long your horse is confined. A product I have recently run across and have had great success with to control the odor problem in my stalls can be found at www.urineoff.com. When I heard about it initially, I was skeptical, for as any horse owner will tell you, horse urine is quite powerful and especially so if you own a stud. Which I do not, but I wanted to give this product a try. All it entails is to muck your stalls out and expose the area where your horse urinates. One of my horses, Racer, always urinates in the same spot, so his stall was easy. I found the bare dirt, and poured 1/2 cup of urine Off on the spot. I did the same in the other stall in six different areas, because Traveler is a sloppy horse when it comes to this bodily function. I immediately noticed after pouring out the solution a pleasant chemical smell taking over the stalls. I wondered if this was just a matter of one chemical overpowering another, which is why I decided to let the solution set for 9 hours before returning. I left it alone all day blocking the horses out of their stall. Before I bed the horses for the night, I covered the spot with fresh bedding. Upon my return to the stalls, I noticed an absence of urine smell and what was left behind was a pleasant odor. I put the horses in their stalls and closed them up for the night. In the morning I returned, and let them out. I mucked out their stall, pitching their manure out the escape hatch into the garden, and I couldn’t help but notice that I did not smell horse urine at all. Three days later, I am happy to report, still no noticeable smell of urine and only on the fourth day did I have to treat the stall floor again. “I stopped in my veterinarian’s office last week and they were all out of Urine Off. I couldn’t believe how disappointed I was! I moped for a few days and couldn’t wait until the new shipment arrived. I don’t mind cleaning up after my two “wee” ones now. I love your product, and it is one of the few products that does just what it claims to do! We moved our two dogs into a house that had previously had both dogs and cats, and they left their own “distinguishing marks” on the carpets. Urine Off removed all the old stains and odors and returned the carpets to their original white. It also worked wonderfully on the colored rugs – no bleaching out or dulling of the color. 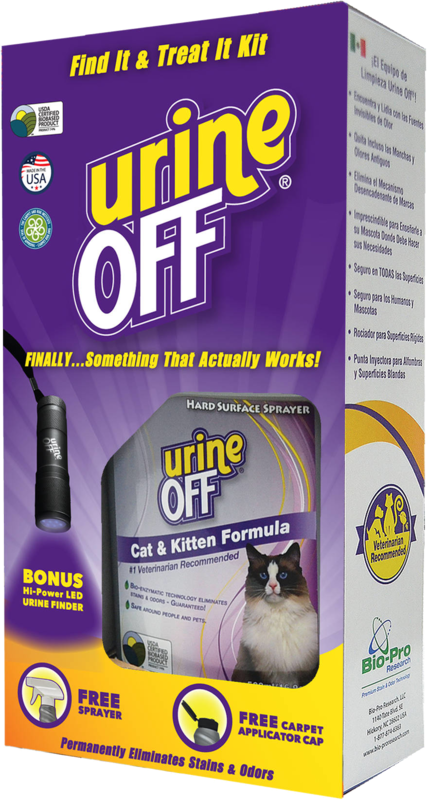 I’ve used all the other products on the market and none compare to Urine Off. It’s refreshing to purchase a home pet product that smells great AND works! “We had plans to install new wood flooring in our home’s first floor over an existing concrete slab. The problem was that, for some reason, our 2 Lab puppies had urinated on the concrete, and they kept coming back to the same area to do it again and again. The smell was horrible. We couldn’t possibly install a new floor over that! We tried ordinary cleaners and ammonia, but no matter how hard we tried, the smell remained. It had soaked right down into the concrete and wouldn’t budge. Urine Off took care of the problem instantly! The odor was completely eliminated, and it has stayed gone. Apparently not even our dogs can smell it, because they have not returned to the old spots at all. “I just wanted to let the company know how pleased I am with Urine Off. We have a full-service grooming facility that opens into the pet boutique and bakery services that we offer. I can’t tell you how many products I’ve tried to keep the facility smelling clean and fresh for customers that come through the door. Your product is fabulous, and I can’t recommend it enough to anyone who is seeking an effective product (and with a nice after smell). We thank you for your business and sincerely apologize for your inconvenience. The LEDs are currently on backorder and will not be available until late April; however, upon arrival, we will ship you a new Urine Finder LED. If I can assist you further, please advise. We thank you again. Interested in more information about Urine Off?